EagleDale I have been an avid user of the Men's HeatGear 6" for several years. I saw the new O series and tried one pair. By the end of the day the legs were bunched up. I hadn't realized that the 0 series were not a compression type like the HeatGear. I have since purchased the tried and true HeatGear and they stay put. For those out there having the same issue, try the HeatGear series. Dave59 Recently bought 2 pair of Series "O" boxer briefs as a result of my original pairs becoming to worn. Originally purchased 10 pair in early 2000. The fit was much better then and the cut was more comfortable. The new style leaves a lot to be desired. Cut smaller in the waist and tighter. Trust me, I am a big van of the product but am disapointed in this new style. BF97 Recently bought 2 pair of Series "O" boxer briefs as a result of my original pairs becoming to worn. Originally purchased 10 pair in early 2000. The fit was much better then and the cut was more comfortable. The new style leaves a lot to be desired. Cut smaller in the waist and tighter. Trust me, I am a big van of the product but am disapointed in this new style. Mike3 Have reviewed the O Series boxer jock product several times; have always commented very favorably on its outstanding comfort and performance. (I wear all three seam lengths; I use them as everyday underwear and simply leave them on for running and weightlifting. Convenient!) My standard single complaint about the product was the lack of choice in colors. How refreshing it was to see some variety in colors and design finally offered in the 6" version! I bought the blue, red, and black patterns, and love their looks. 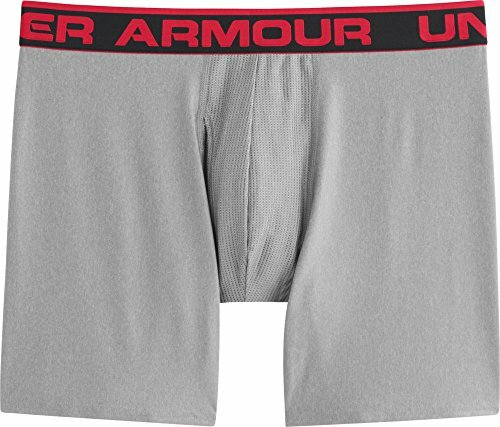 (If you are in underwear 24/7 as I am and are paying what UA charges for its product, they ought to look good!) Now, please add the new designs and colors to the 3" and 9" seam lengths, and I will buy them, too. Thanks, as always, for a wonderful product that combines utility with comfort and fashion. bc13 I love the O series underwear, they are the only underwear that I will wear. I've tried the other series and I keep coming back to the O series as they have the best feel and comfort. One thing that I have noticed is that the sizes have gotten smaller over the years. 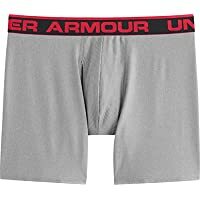 UA started out years ago with the heatgear boxerjock and I wore a large in those now with the O series I cant wear a large as they are super tight which I dont understand why they did this. Now I have to wear a XL in the O and they fit great in the waist like the original heat gear boxerjock lg but the XL O series fit a bit big in the rear that I just have to deal with. I really wish they didnt mess with the sizing like they did cuz it was perfect before. I would still recommend over anything out there though. PhoenixRise Recently i was at a dermatologist for itching around the groin area, Apart from the medicines & the usual stuff, he told me how important it is to keep the area dry especially when spending hours sitting in the office. This could also generate a lot of heat around the area and can affect the skin texture and color. For both these reasons, he asked me to throw away all my cotton underwear and start using Under Armour!! !..lol..first i thought someone is definitely paying him commission for this pitch but thought i will give it a shot anyway. So went ahead and purchased the 6" and 3" O series. Gotta say i am glad i gave it shot. It is so freaking comfortable & hugs to the body perfectly. If you wear medium size in general, you would need size large to be comfortable. Baldeagle I only wear UA underwear and wouldn't consider anything else. My only small complaint is that they seem to fit different from order to order (or by color, not sure yet). I wear L - 5'10", 33 waist and 170lbs - and considering giving XL a try. Anyway, the gray pairs seem to fit much tighter than the black or white ones, thus XL for gray?. They all say same 90/10 make up. In fact, that would be my one complaint about UA in general; their sizing is all over the place and there's little consistency. The fact that they have a strong internet sales presence, maybe they should consider making their products more uniform in size or include more in depth size info for each item such as height, weight, to save us all return shipping charges, etc. Still the best though! Skisouth I started wearing Under Armour Heat Gear as a South Florida police officer under my law enforcement equipment. I bought other brands to test in the heat but nothing compared to Under Armour for comfort and performance. When my kids started playing sports seriously so I started buying Under Armour for them. They enjoy the performance but also the look. I've since retired from the police force but work in Africa, and yes it's Africa hot! and yes I still wear under Armour both for the professional look and the performance of both Heat Gear and Cool Gear. I would recomend the products all day long. If you've tried other products test them against Under Armour as I did and I think the difference will surprise you. Under Armour delivers what it says it will. ContractFF I first discovered the UA Boxerjock when I was working as a firefighter in Iraq. I bought 10 pair in 2005 and was instantly hooked. These are the only underwear I use, day in and day out - 24/7. It would be an insult to only call these the best.... they're beyond that. I am just now purchasing more to replace the originals I purchased almost 7 YEARS AGO. I'm still wearing the old ones, but the waistbands are just now starting to loosen up...vaguely. Thank yo UA for a phenomenal product. I am now, and have been, committed to wearing your boxerjocks for the rest of my life.